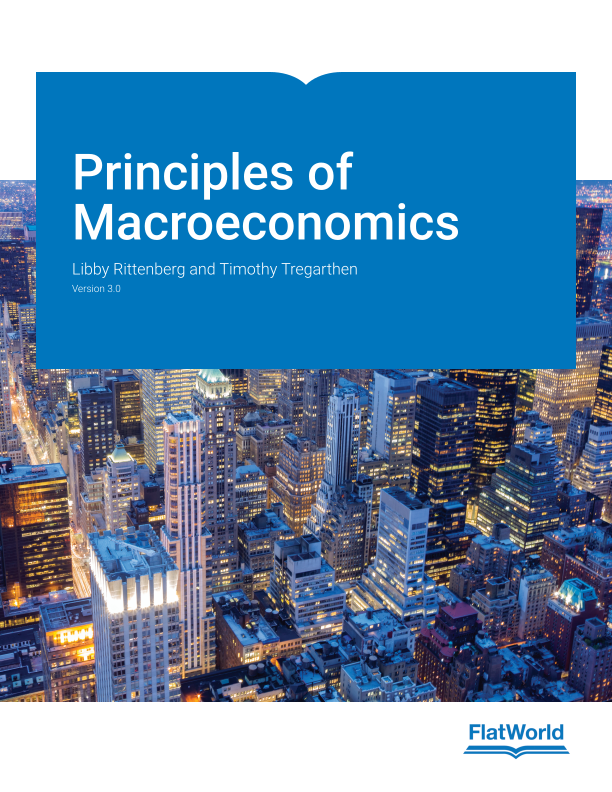 This textbook is suitable for the following courses: Introductory Macroeconomics, Principles of Macroeconomics, Principles of Economics. In Principles of Macroeconomics, the authors explore the effects of political uncertainty. The authors explore how political outcomes of events, such as Brexit and the election of Donald Trump, affect economic policies and economic outcomes. Throughout the last decade, economists have received the public’s attention, and the authors saw an opportunity to share economic principles and thinking in a way that emphasizes their relevance in today’s world. Each concept is covered with a “Heads Up” section to clarify potentially confusing aspects. The “Try it” sections encourage students to walk through scenarios related to each concept and idea. The “Case in Point” features use real-world applications to harness concepts in reality. 8.1 Start Up: How Important Is Economic Growth? 9.1 Start Up: How Many Macks Does It Cost? Dr. Libby Rittenberg is Professor of Economics at Colorado College since 1989. She has been the Dean of the Summer Session since 2003. She frequently teaches the Principles of Economics, Intermediate Macroeconomic Theory, Comparative Economic Systems, and a senior seminar on the International Political Economy. She received her Bachelor’s Degree from Simmons College and her Ph. D. in Economics from Rutgers University in 1980. Throughout her career, she was very involved in study abroad education and directed programs in central Europe and Turkey. She was a Fulbright Lecturer from 1982-1984. She recently became professor emeritus. There is one word that captures the essence of Dr. Timothy Tregarthen - inspiring. Tim was first diagnosed with MS in 1975. Yet, he continued a remarkable academic career of teaching and research. In 1996, he published the first edition of his principles of economics textbook to great acclaim, and it became widely used in colleges around the country. That same year, MS made him wheelchair-bound. The disease forced his retirement from teaching at the University of Colorado at Colorado Springs in 1998. He lost the use of his arms in 2001 and has been quadriplegic ever since. In 2002, Tim’s doctor expected him to die. He was placed in the Pikes Peak Hospice program, and was twice given his last rites by his priest. UCCS Chancellor Shockley-Zalabak says that “I really thought that Tim would die in Hospice. That’s what the doctors told me, and I really believed that. I remember one day they called me and told me to try to come see him. They didn't expect him to live through the night.” Not only did he live through the night, but eventually recovered to the point that he moved from hospice to a long term care facility. There, he never let his disease get him down. In fact, he turned back to his love of writing and teaching for inspiration. He obtained a voice-activated computer, recruited a co-author, Libby Rittenberg of Colorado College, and turned his attention to revising his principles of economics book. FlatWorld is honored to publish a new, first edition relaunch of this wonderful book, and proud to bring Tim's incredible talents as a teacher back to life for future generations of students to learn from. In addition to completing the re-write of his textbook, Tim recently completed an autobiography about the 32 years he has had multiple sclerosis, titled Suffering, Faith, and Wildflowers. He is nearing completion of a novel, Cool Luck, based on the life of a friend. It is the story of a young couple facing the husband's diagnosis of ALS — Lou Gehrig's disease. Remarkably, in 2007, he was able to return to the classroom at UCCS, where he taught economics for 27 years. Perhaps Tim’s approach to life is best summed up by an observation by UCCS English professor Thomas Naperierkowski: “One of the remarkable things is, heck, I can wake up with a headache and be a pretty grouchy character, but given his physical trials, which he faces every minute of his life these days, I've never seen him grouchy, I’ve never seen him cranky.” Carry on, Tim.